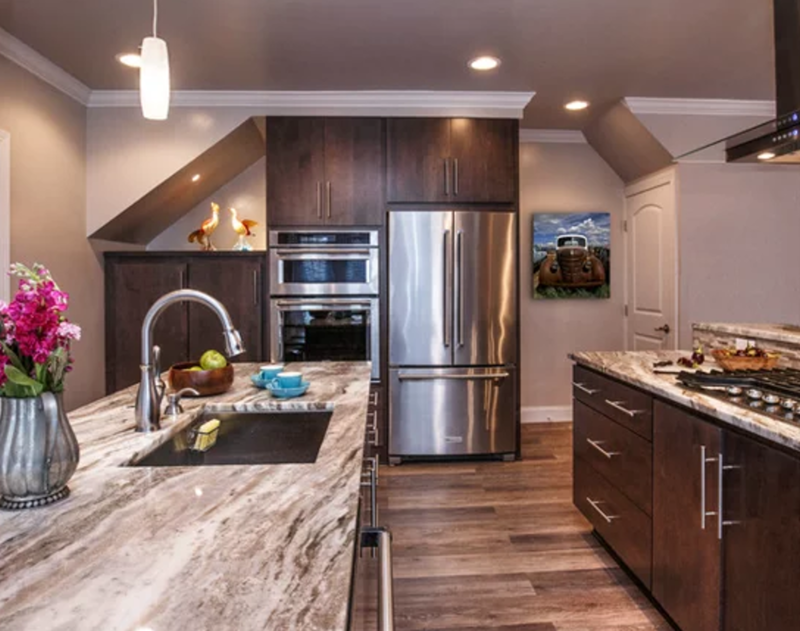 Kitchen design is what Performance Kitchens in Manayunk, PA, is all about. We’ve been designing kitchens in our showroom office since 1974. 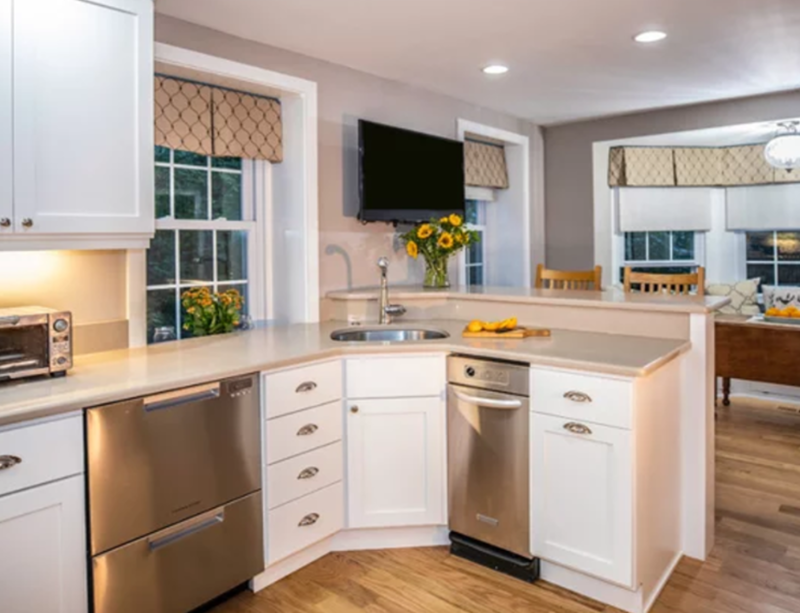 In the intervening period we have designed and installed countless kitchens on the Mainline, in Philadelphia, South Jersey and all the surrounding areas. When customers participate in our kitchen design process, they often ask us to describe the different types of popular kitchen layouts. 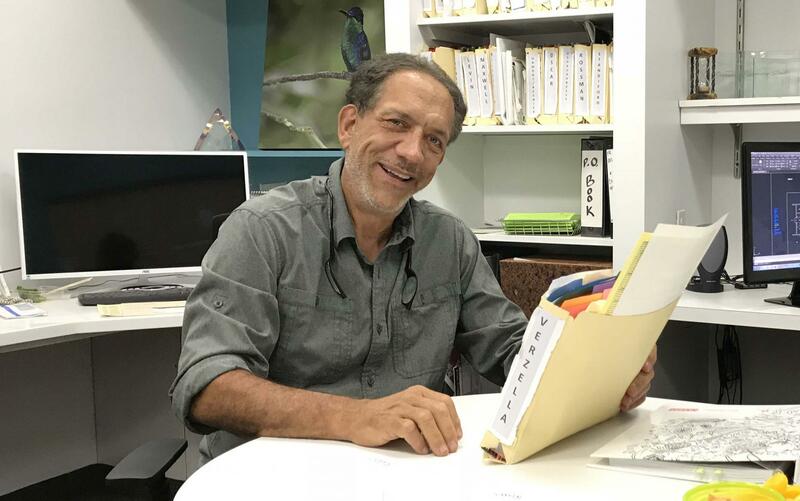 In this article I will describe and provide examples of each of the major types. There are several forms that the u-shaped kitchen takes in popular kitchen layouts. In some configurations, it is a kitchen design that features three walls which are lined with appliances and cabinets. This is an efficient design that can free up considerable floor space. If the layout of the house does not allow three walls to be used for a u-shaped kitchen, an island can be installed to serve the same purpose. U-shaped kitchens can be incorporated into many kitchen styles, and the size of the kitchen is not important. Its u-shaped design makes it easy for chefs and homeowners to access various areas of the kitchen without needing to walk across the room. When homeowners are designing their u-shaped kitchens, they should try to place their most used appliances or work areas into a single triangle of space. This will allow them to work more efficiently each time they are in their new kitchen. See my other recent article that discusses the kitchen triangle. 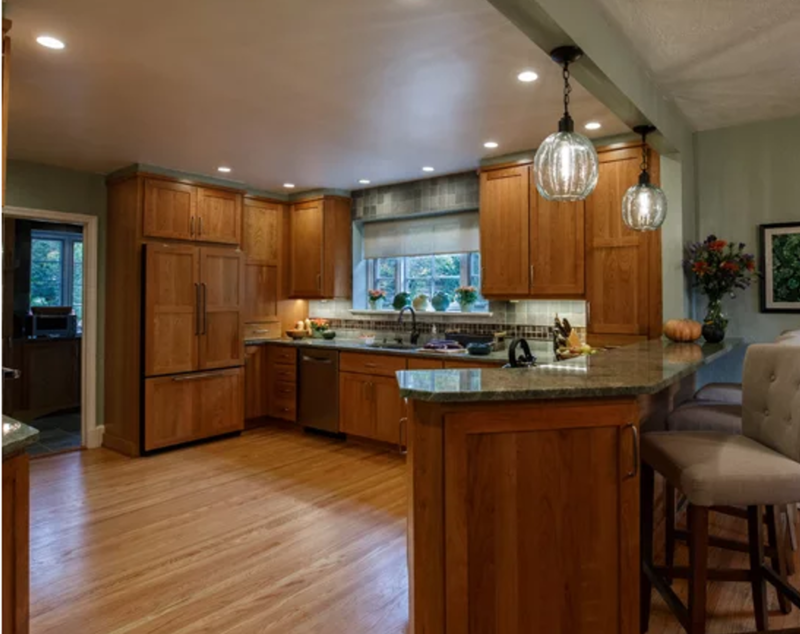 A corridor kitchen, also sometimes referred to as a galley kitchen, is a kitchen space with more length than width and is another one of the Popular Kitchen Layouts. Corridor kitchens are economical on space but can be less than ideal if not properly planned with a kitchen design team. Many apartments or converted homes in the Philadelphia area will have a corridor kitchen. And while some homeowners would prefer more space than a corridor kitchen will allow, it is important to note that most restaurants utilize the corridor kitchen concept because it can actually be a very efficient way to work if a kitchen triangle is incorporated into the design. Well-designed corridor kitchens often have open shelving or door-less cabinetry because incorporation of closed cabinetry can shrink the visual space of the kitchen and add make it feel a little close. To open up a corridor kitchen, some kitchen designs incorporate an access window into the space to simplify the transference of food to the dining area. 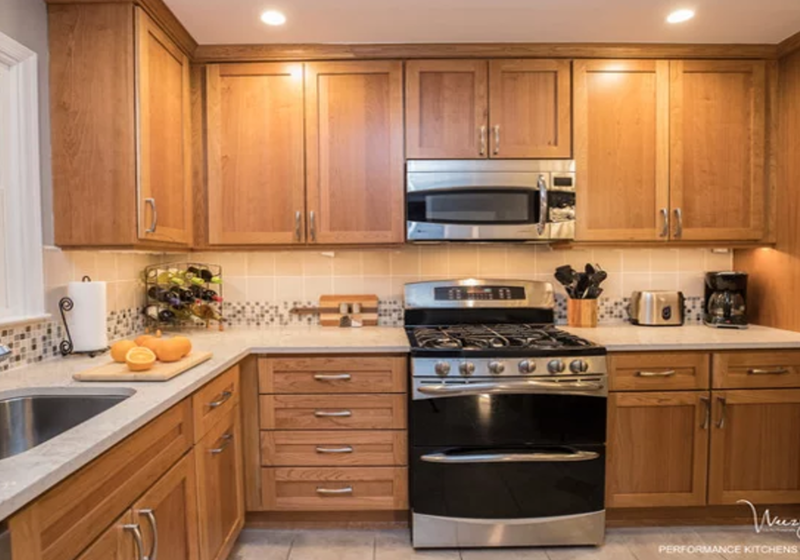 A G-shaped kitchen is the term used to describe a cabinetry configuration that has a preparation-area peninsula and is another one of the Popular Kitchen Layouts. The G-shaped kitchen is an expansion of the U-shaped configuration and is often a plausible upgrade for those that already have the latter type of cabinetry design currently installed. G-shaped designs also increase the number of base cabinets that can be included which increases storage space while streamlining the cooking area. What makes the G-shaped design popular is not simply that it provides a large amount of storage space. What is more important to a chef or cook is that the G-Shaped kitchen is specifically useful in the way that it at surrounds the chef with a variety of nearby countertop options and immediate access to supplies. The increased countertop space is reachable and usable during the entire cooking process. This optimal kitchen floor plan is likely to provide preparation, cooking and clean-up areas within an easily accessible position centrally located in the kitchen’s central area to facilitate greater cooking efficiency. The peninsula of the G-shaped kitchen offers a tighter countertop area for larger kitchens. The L-shaped kitchen layout is a very common design for home kitchens and is another one of the Popular Kitchen Layouts. The L-shape layout was developed long ago, but the ergonomics of it make it a sensible and popular choice that is appropriate even for the modern home kitchen. The thing that makes the L-shaped kitchen design so popular is that it facilitates the kitchen work triangle in the preparation, cleanup and cooking areas. The L-shaped kitchen easy to incorporate into almost any kind of décor scheme and the shape simply refers to the floor plan layout that looks like a letter L.
To achieve a proper L-shaped kitchen design in a home, the kitchen must be built at a corner where two walls form a perpendicular angle and where one wall is twice the length of the other. The term peninsula refers to an extended counter area that is popular in the G-shaped kitchen floor plan. A kitchen island is a great addition, but most kitchens lack the room to sensibly fit one of a usable size in the center of the available workspace. This is why the peninsula is as popular as it is practical. 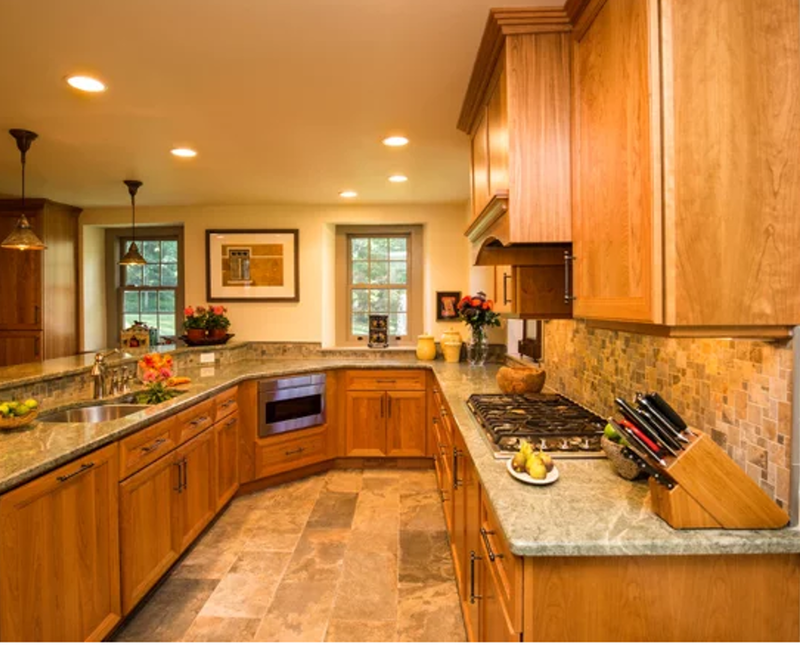 A kitchen peninsula is comparable in size and shape to a standard kitchen island, but the primary difference is that it is butted up against the end of a cabinet run or against a wall. This is how the G-shaped or J-shaped floor plan is achieved. The peninsula is a valuable addition to any kitchen because it gives the opportunity for increased base cabinet storage space and countertop space. The additional space can be used as an enhancement to the kitchen’s primary cooking triangle by making it a storage area for pots and pans and the counter for preparation. The peninsula can also be utilized as a secondary cooking area with the installation of an auxiliary cooking top. A peninsula is also a great room divider that visually opens a space by replacing the need for a full-length wall. One wall kitchens are typically found in apartments and smaller homes where square footage is at a premium and the owners want to maximize the rest of their living space. kitchens are found typically in small homes and efficiency apartments to conserve floor space and construction costs. A one-wall kitchen has all of the appliances, cabinets and countertops on one wall. This allows the owner to perform all tasks in a single workspace. Due to its limited space, a one-wall kitchen will often contain a compact refrigerator and range. These two appliances are frequently separated by a sink. Modern one-wall kitchens may feature an island that is located across from the wall, which allows the resident to have more workspace. Other consumers rely on their kitchen tables to provide additional surfaces on which to prepare food. While a one-wall kitchen is limited in its options, it does have its benefits. A one-wall kitchen allows the resident to prepare, cook and clean-up in a single space, which is very convenient. The layout has also become popular for homeowners who have plenty of space but want the kitchen to remain open. If you’re remodeling your kitchen and you’re considering a one wall kitchen, read through our guide on tips and inspiration for designing a one wall kitchen layout.